This galaxy cluster, MACS J0416.1-240, is 4 billion light-years from Earth. A new study found that the most massive galaxies in these clusters lined up with the overall clusters' distributions early in the universe's history. Galaxies can form pointing every which way in space, but researchers have been surprised over the years to find that the most massive ones in huge clusters lined up to match their overall clusters' direction. Now, a new study suggests that galactic giants took on that orientation as early as 10 billion years ago. 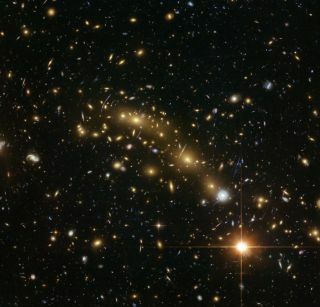 Researchers peered at 65 galaxy clusters using data from the Hubble Space Telescope. These galactic metropolises can host hundreds of thousands of individual galaxies and are located billions of light-years away from Earth. In this data, the researchers saw that the brightest galaxies were already aligned with the overall cluster when the light first left the galaxies and headed toward Earth — which was when the universe was just one-third as old as it is now, researchers said in a statement. The new study marks the earliest this effect has ever been seen. The researchers noted in their new paper, published yesterday (June 12) in the journal Nature Astronomy, that only the brightest galaxies in galaxy clusters seemed to align with the orientation of the galaxy cluster as a whole. "The primary factor that appears to determine whether a galaxy is aligned with its host cluster is that it must be the brightest cluster member, which suggests that there is something special about the birth and evolution of those galaxies," the researchers wrote in the paper. The result brings researchers closer to understanding how those alignments come to be. It does so by putting a constraint on how quickly that alignment must have happened, the researchers said. One hypothesis holds that gravity slowly pulls the largest galaxies to line up with one another; another explanation suggests that galaxies grow by accumulating smaller galaxies preferentially in certain directions because of the cosmic web. This enormous network of filaments was imprinted by quantum fluctuations in the early universe. In their paper, the researchers also suggested that the galaxies might have been aligned with surrounding matter as they started to form. The researchers said they hope to look at even earlier galaxy clusters to further push back the limits on the alignment effect. This will help them determine if it must have happened even faster, or to find a time when the galaxies were not yet aligned, the scientists said. Such research with Hubble will push the limits of current telescope technology, West said. "We're trying to measure the shapes and orientations of galaxies that appear very faint and very small because of their great distances, which is challenging," he said in the statement.